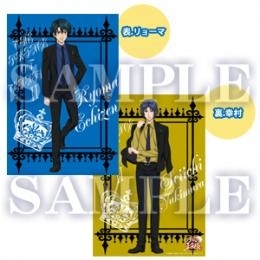 C-1 : Atobe Tapestry A : Ryoma & Yukimura JUMBO CUSHION!!!!!!!!! Shiraishi is beautiful in his suit!!! Good luck on getting the mug! Question: Is it possible to buy any of these from somewhere? Yeah, the suits are awesome!!! I don't know if I'll be able to try again because it says "up to ten each", not sure if it's each person or each time buying, so I may or may not be able to try for the mug... We will see!!! Ahhhh gotcha. Why must all of the good stuff be hard to get???? 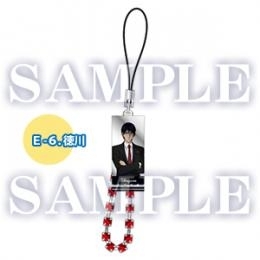 I'm eyeing the phone straps. Especially the Tokugawa and Tezuka ones (gosh, their art turned out so well). I like the Shiraishi and Yukimura art quite a bit too. 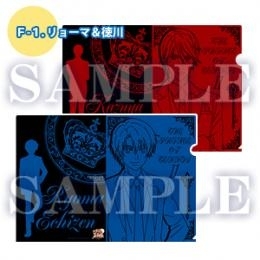 Echizen looks so cool (blue, I love blue, but he's not one of my favorite characters at all). 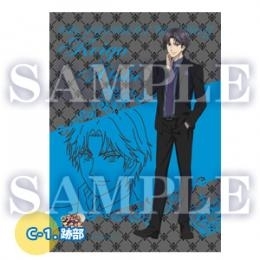 Are those frills on Atobe???? Ahhhhh, I see. Does it cost a lot for one lottery? 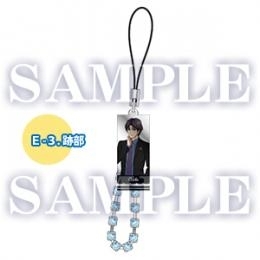 I know I'd totally buy the Tezuka and Shiraishi ones off of you... and I might as well buy Atobe because he will be sad with me if I don't and buy the others... Oh collection completing... x.x If you land another Tokugawa, he's my number one choice. THREE JUMBO CUSHIONS /o\ ! Good luck with figuring out that - they might send them in vacuum sealed packages like some companies do with novelty pillows? That way they don't take up so much darn space! Mug, did you get it? Thanks!!! I'm excited to see them! I don't know if I will keep the jumbo cushion though, I have two Tenipuri pillows already. Shipping will be crazy, I have to find a better way to get it here. But still excited! !